When humanity first dreamt of flying, lo these many centuries ago, it probably didn’t realize what a freaking hassle it would be to slip the surly bonds of Earth and touch the face of god. Because it turns out things are pretty surly up in the skies, too (or, at least, in planes that are preparing to launch themselves into them). Less than two weeks after United Airlines had a terrible, no good, very bad PR day—when it ordered its security guards to violently drag a man who refused to give up his seat from the plane, bloodying his face in the process—its competitors at American are apparently taking a run at the bad customer service throne. Since having the words “violence” and “baby” in the same sentence together is rarely considered ideal, boarding was delayed as staff tried to calm the woman down. There’s no video of the inciting incident, but we do see what happens next: Another passenger steps forward, demanding to know the name of the crew member who took the stroller. He sits down for a minute, but pops back up when the man in question returns to the plane, and that’s when things go from “bad look” to “PR nightmare” for everybody involved. “You stay out of this,” the crew member tells the guy, who pushes out of his seat. The dialogue after that is a little hard to hear over a bunch of aggressive posturing, but at one point, the flight attendant clearly says “Come on, hit me” while gesturing to the passenger to take a swing. The two men were quickly separated—thus denying news writers everywhere the chance to escalate this thing to “airplane brawl”—with crew visibly holding their colleague back. “Tony,” the passenger, was gently ushered back to his seat, with a flight attendant telling him the incident was an “accident.” “It was not an accident,” Tony replies. In a probably too-late effort to not be the next United, American swiftly issued an apology for the incident. “The actions of our team member captured here do not appear to reflect patience or empathy, two values necessary for customer care. In short, we are disappointed by these actions. 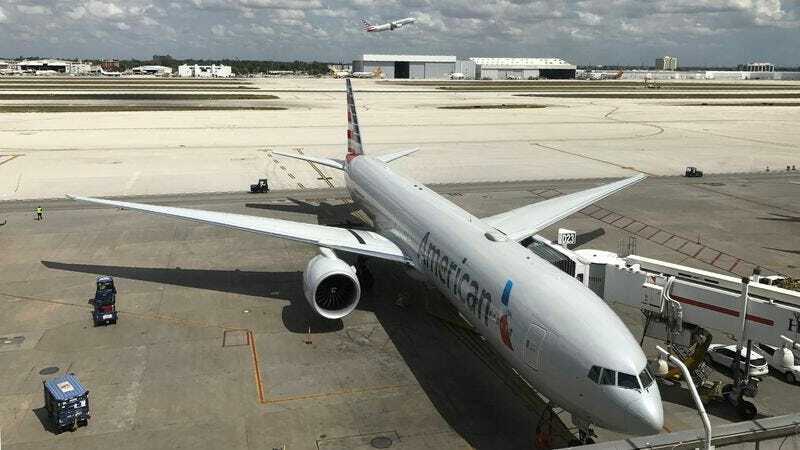 The American team member has been removed from duty while we immediately investigate this incident.” The woman and her family, who ended up leaving the flight, have been bumped up to first class accommodations for the rest of their international trip. Meanwhile, in other airline news, a federal Air Marshal reportedly left a loaded gun in an airplane bathroom this week. (A very polite passenger returned it to the airplane’s crew.) So, yeah: that old “flying is the safest way to travel” statistic is taking some hits these days.